It’s a common story. People get injured and their house becomes home to 20 grab bars strategically located so that getting up and down is never a problem. What about navigating kitchen cupboards? Bathroom sink? Alternatively, parents express to their children that they do not want to move to a retirement home or a senior’s facility. But what are the options? There are too many stairs in those old houses. Universal design has become a bit of a trendy buzz word in recent years, but some may not know what this means exactly. 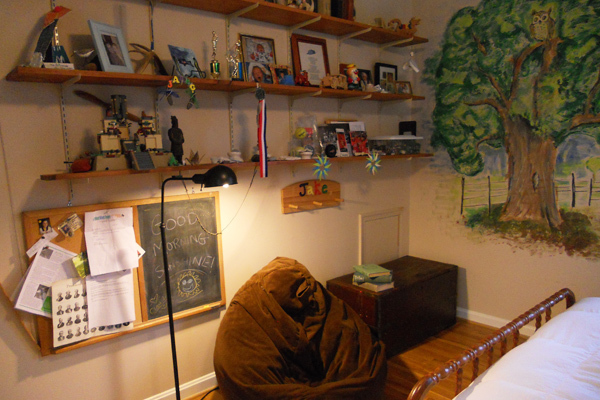 Simply put, universal design is the answer to a growing need in the home: accessibility. Essentially, universal design is about creating a beautiful space that everyone can live in/visit both now and in the future. Age, size, ability… none of that matters. With universal design, there is safe access for everyone. Needs and abilities can evolve over time so universal design allows residents to live in and enjoy their home during all stages of their lives. The trend was given a big boost by the recent dip in the economy. Homeowners would rather remodel than buy a new house. But ultimately, the reason to embrace universal design is the desire to age in place. An AARP National Survey found that 67% of people age 45 and over want to remain in their homes as long as possible. That number increased, up to a whopping 90%, as people age. Someone had to respond. Architects and builders embraced that desire and began to create homes with unique features that provide safe access for people of all ages. So, it started as a solution to the “age in place” dilemma but has expanded to providing livable homes for anyone and everyone. It’s also important to note the word “design.” This is not just about adding grab bars around a home. Universal design means creating a beautiful home that happens to have features hidden in the design that will help homeowners and visitors alike. If you own a multilevel house, you can incorporate universal design by adding a home elevator or wheelchair lift, making the home you love more accessible in the future. So get creative. How can you update you home now so that you can enjoy it well into the future? Photo courtesy of Total Access Co.
A great home elevator must start with well-designed inner workings to provide reliability, safety and quality performance. Like a fine automobile though, most people are also interested in the aesthetics. After all, an elevator will be an integral part of your daily life. Savaria dealers really get that idea and are always up for the challenge of meeting their client’s ideas for customization. Home owners with a love for interior design or those with the desire to show off their personal style may want to aid in the idea and design process. Builders may opt for a customized elevator as a unique selling feature to increase the property value of a new development. Clint Cox, sales consultant with Savaria dealer, Total Access Co., recently worked with local builders to install two custom glass elevators. Glass can add both beauty and functionality to a home elevator. The first project was a deluxe 2-story penthouse in Philadelphia (pictured above). 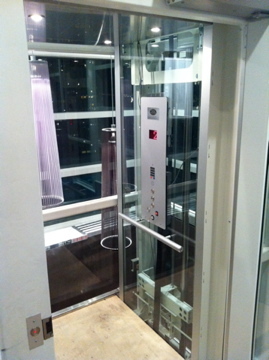 Commissioned by Total Access, this elevator achieved feats of accessibility and style. The stainless steel hoistway – the space through which the elevator travels – was welded on site by the builder, positioning the elevator in the center of the suite. Enveloped by a spiral staircase, this elevator has a freestanding appearance and adds elegance and intrigue to this modern space. Frameless glass panels were added, along with a customized stainless steel keypad phone. With its sleek appearance, this developer added value to this Philly penthouse. Next up was a beachfront property. The owners were in need of an elevator but did not want to lose their waterfront view – understandably so! Once the simple glass concept was dreamt up by Total Access and the homeowners, Savaria built the glass cab elevator. Builders then constructed a hoistway using safety glass and customized hidden wiring was installed by Total Access. Most importantly, the owners retained their beautiful view of the beach. The complement of your ideas with a Savaria elevator makes your home uniquely convenient and luxurious. And that’s a combination that always rises to the top.